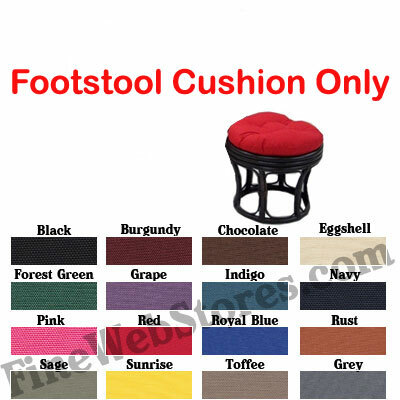 The Papasan Foot Stool Cushion comes in several sizes. The sizes are 16 inches, 18 inches, and 20 inches wide. Make your size selection above. The first price shown is for a 16 inches wide cushion use the drop down menu to select a larger size. This is perfect for replacing a footstool cushion, pet bed or a seat at the game. The footstool frame is not included. This is a round footstool cushion only. Our cushions are filled with soft poly fill.